AT&T Office@Hand supports an array of tested Polycom IP Phones which work well with your AT&T Office@Hand service. This article will guide you on how to use the Polycom Web Configuration Utility for VVX 310 and 410. After you have set up the Polycom VVX 300, 310, 400, and 410, you are now able to place and answer calls using the default configuration. To learn more about the Polycom VVX 300, 310, 400, and 410, click here. Check the IP address of your Polycom IP phone. Note: To see the phone’s IP address, select Settings icon from the phone’s Home view then select Status > Platform > Phone. Scroll down to see the IP address. On your computer, launch a web browser then enter the IP address of the IP phone in the address bar. Note: In this example, we used Mozilla Firefox and the IP address as 123.45.678.90. 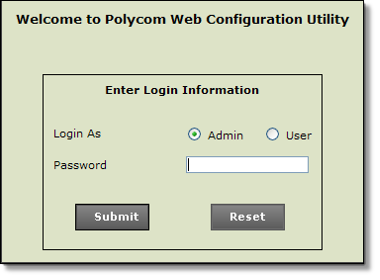 The Polycom Web Configuration Utility login window appears. Select Admin or User and enter your Password in the field provided. Note: The default password for an administrator is 456. The default password for a user is 123. The Utility’s Home screen displays. Enter your desired configuration changes to the phone’s configuration. Note: Click here to learn how you can obtain the SIP configuration information from your AT&T Office@Hand online account. Log out of the Polycom Web Configuration Utility.